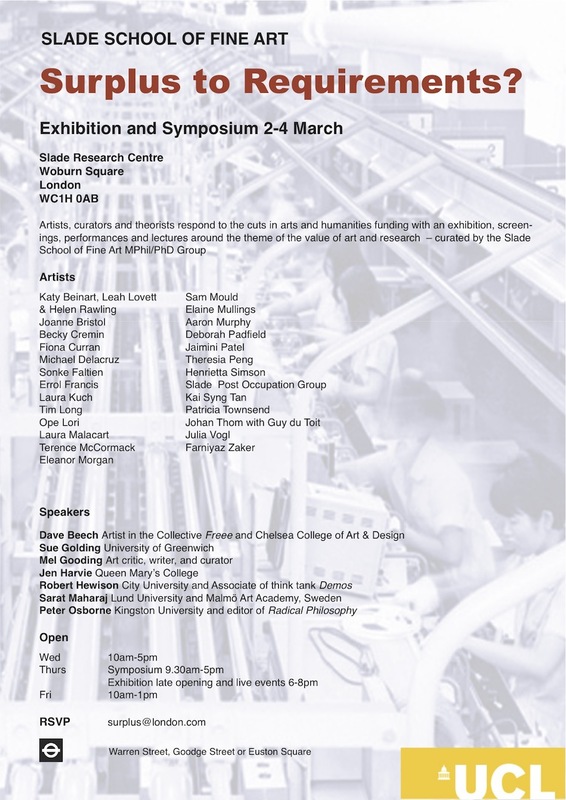 COME TO THE SYMPOSIUM + PRIVATE VIEW OF OUR GROUP SHOW at WC1H 0AB 3rd MARCH! We’ll be there to sell signed prints to raise funds for our run for Shelter, and premiere a new work. Exhibition and Symposium 2nd – 4th March 2011. The recent student demonstrations were reported in the mainstream media as demonstrations about the coalition government’s proposed rise in tuition fees. There was scant debate about the huge cuts and fundamental changes to arts and humanities funding that are also part of the proposed changes. Is this because as a nation we don’t care about these subjects? ‘Surplus to Requirements?’ is a three day event organised by the Slade PhD students that will comprise an exhibition, installations, performances and presentations given by students and invited artists, theorists and curators, around the theme of the ‘value’ and significance of art and research in the current political and economic climate. It will ask what criteria are being used to ‘measure’ art’s value and contribution to society? It will explore ideas around expenditure and consumption, the role of the art object as a commodity. Is art superfluous or an essential part of society? How do we measure excess in these terms? In counterpoint to the commodification of art, the importance of bodily and material aspects will be explored, using theorists such as Adorno, Grosz, Deleuze and Guattari, Bataille, Marcuse and Marx. Attendance at the one-day symposium is free but please e-mail surplus@london.com to reserve a place. This entry was posted on Monday, February 21st, 2011 at 20:05	and is filed under GIGS & EVENTS and tagged with existence, happiness, health, this life. You can follow any responses to this entry through the RSS 2.0 feed. You can leave a response, or trackback from your own site.